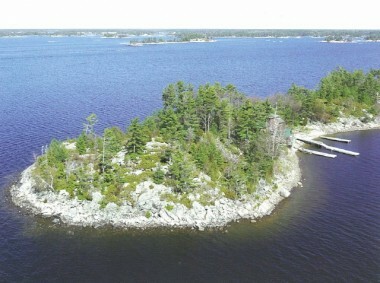 RARE OPPORTUNITY TO ACQUIRE THIS VERY PRIVATE AND UNIQUE PROPERTY LOCATED ON THE NORTHERN POINT OF THIBODEAU ISLAND IN THE EXCLUSIVE COGNASHENE AREA OF GEORGIAN BAY. THE NORTHWEST END OF THE ISLAND HAS A FAMILY COMPOUND. THERE IS ONE 3-BEDROOM, WINTERIZED, SELF-CONTAINED, LOG SIDED COTTAGE WITH A GRANITE FIREPLACE. THERE IS A DRY LAND BOATHOUSE WITH A ONE BEDROOM BUNKIE ABOVE AND ANOTHER SLEEPING CABIN THAT CONTAINS A LAUNDRY ROOM. THERE IS ALSO A TWO STOREY WINTERIZED, 3 BEDROOM COTTAGE WITH WOOD STOVE. DOCKING IS AT THE SHELTERED NORTHERN END WHERE THERE ARE 3 FLOATING DOCKS. BECAUSE OF ITS LOCATION, BLACK FLIES AND MOSQUITOS ARE MINIMAL. SWIMMING IS IDEAL – DEEP WATER FOR ADULTS AND A SANDY BEACH FOR CHILDREN. 5.16 ACRES TO ROAM. 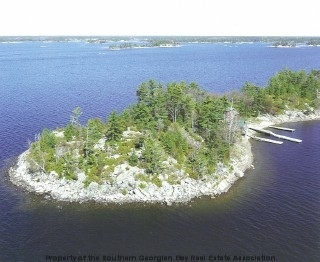 2,355 FEET OF WATERFRONT WITH TWO BEACHES, GRANITE OUTCROPPING, MAJESTIC PINES, SPECTACULAR VIEWS AND DEEP WATER, PROTECTED DOCKAGE. FIFTEEN MINUTES BY BOAT FROM MARINAS IN HONEY HARBOUR. For more information and or to buy a similar property – Honey Harbour Cottage please contact Rick Hill.